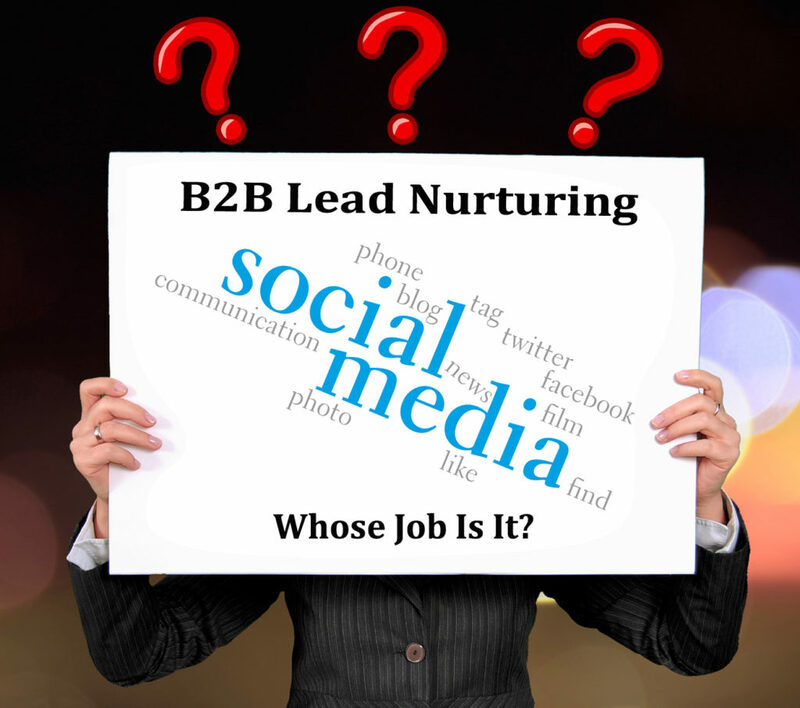 Who Should Nurture B2B Leads with Social Media? B2B marketers have always been more resistant to using social media than their B2C counterparts, which is in large part a mind-set issue. Only five years ago, almost half of B2B executives still thought social media was irrelevant to their company, and this attitude has definitely had an influence on slower adoption. However, B2B organizations are finally starting to ramp up their use of social for marketing and sales. According to the 2016 B2B Marketing Trends Report by Webbiquity, B2B spending on digital marketing programs is projected to rise 15% over the next five years, and the share of budget dedicated to social media marketing is set to more than double. The Webbiquity report also indicated that companies view increasing brand awareness as their top objective on social channels, followed by lead generation. However, many are still missing the boat when it comes to using social platforms to nurture those B2B leads. Why? There is still some work to be done on that mind-set issue. Even though their companies are now actively using social channels for marketing purposes, the C-Suite is still not actively engaged. Only 27% of top companies say their C-level execs are active on social platforms. Executives can no longer ignore these channels when their entire consumer base is actively using them for research and communication during the buying cycle. They at least need to understand the basic workings of the platform, how their marketing staff use it, and how people communicate on it before dictating social policy. More importantly, their attitudes and actions regarding social media use influence the way others in the company view it . Nurturing leads may not be in an executive’s job description, but social media broadens the scope of what nurturing is, who can participate and how it is done. While more B2B companies are allocating marketing budget to social media, nurturing is still viewed primarily as a function of sales. However, there are many people in a B2B organization who could potentially nurture a lead on social channels. You never know where a person will come across information online or where they might be in their buyer’s journey, so it pays to broaden the scope, and educate everyone in your organization on how to use social effectively. In an earlier blog post on social selling, I discussed the need to better equip sales staff on how to use channels like LinkedIn to build relationships—but virtually any employee can act as a nurturing point if they’re empowered to do so. This means we need to teach all employees to use social channels effectively—and not just the company channels, but their personal profiles as well. 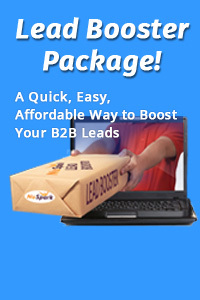 Who Can Nurture B2B Leads? Executives: The C-suite is in a unique position to not only be the governing heads of the organization, but also thought leaders in their industry. At the very least their personal social profiles like LinkedIn should be fully optimized. They should also be sharing content regularly on them, not just on the corporate channel. Because they’re the heads of the company, being a good example goes a long way toward making other employees comfortable with using social channels as brand advocates. That means executives need to be comfortable “being social” as well, and not just having someone post content for them. Customer Service/Success Reps: Many customers and prospects want the companies they deal with to have a presence on social so they can get questions answered quickly. Teaching your customer service employees how to use social platforms correctly to listen and smooth the way for customers can make a huge difference in your company’s brand perception. Other Employees: More and more people entering the workforce are digital natives. Given the right guidance and training, any employee can act as a brand advocate. Who better to sing your praises than a person who knows your business and is secure in the knowledge of what’s appropriate (and not appropriate) to share? Companies like Dell and others that encourage employees to share helpful information or talk about their day at work experience broader visibility in social channels. This kind of social activity is a kind of nurturing because it transcends your marketing message and increases the perception that your brand is approachable. Social channels give us a window into the lives of consumers that no other medium can offer. We can find out more about them personally by browsing their social profiles, listening to their concerns and observing their behavior. Companies that focus on using social not just for brand awareness and generating leads, but also reaching out to nurture those leads build connections that result in much higher returns. That means getting personal—and staying in touch—on any channels the customer likes to use. The old marketing mantra “Be where your customers are,” takes on a new meaning in social channels. It’s about building relationships and an emotional connection. The “Unique Selling Proposition” (USP) is no longer relevant: 86% of B2B buyers see no real difference between suppliers. B2B marketers who connect with buyers on an emotional level have twice the impact of those who sell business or functional value. Those who sell using business or functional value see a 21% lift in perceived brand benefits; those who use professional, social and emotional connection see a 42% lift. Broadening social use within your company is a good way to build that “high brand connection” with prospects and customers. In conjunction with content planning, marketing automation, paid advertising, and phone calls, think about incorporating social more fully to create a true omni-channel approach to nurturing. Connect your customer-facing employees with each other. Teach them how to use social platforms correctly. Give them access to your content pool and make sure they are on the same page with social policy. Identify potential advocates within your ranks and encourage them. De-compartmentalizing social use within an organization may seem like a risk, but fearful thinking in today’s digitally driven environment limits your potential reach. Social media communication has been woven into the fabric of everyday life, so companies who want to stay relevant to their consumers should re-think their current use of social channels for nurturing. What could your bottom line could look like if more people in your business could make more emotional connections with more prospects? NuSpark Marketing Executive Director of Social Media Apryl is an experienced marketer, author, and social media coach. Using a “content first” philosophy, she helps clients assimilate a focused social media strategy into their marketing plans, actively engage social audiences and grow communities.